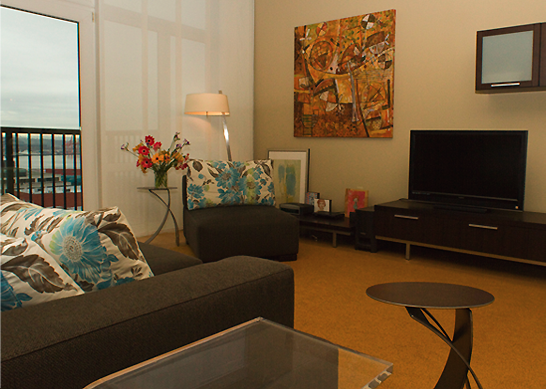 My client moved out of a house into this downtown condominium, which needed an economical overhaul. For example, she didn’t like the kitchen counter tops but didn’t want to spend a fortune on new ones, so we added gorgeous large tiles on the back splash. They were so good looking that the client stopped disliking the counters. We also repainted, added cool, inexpensive flying saucer pendant lights. In her living room, we accommodated my client’s penchant for order in her busy professional life with a clean, simple, modern style. The view of Mt. Rainier is so “front and center”, we kept the furniture low, comfortable and “loungy”, making it more conducive for entertaining friends. The bathroom needed help, but we didn’t want to gut it. To save money, we just added cut crystal sconces, a pretty mirror, custom shower curtain, interesting abstract poster art, and new paint.